Endowments are excellent vehicles for investing in long-term success, and an endowed UWM Libraries Directorship is a high priority. A great university cannot exist without a great library. The Director provides vision and leadership that influences the success of the university and the entire academic community. This role is particularly important because we are southeastern Wisconsin’s largest academic library. The management of such a complex, vital institution requires exceptional professional knowledge, combined with a skill set that can build teams and partnerships across the campus and throughout the community. 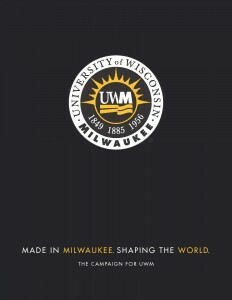 An endowment will establish a foundation of support to ensure that UWM always has an innovative leader and talented administrator in this crucial position. Graduate student interns gain professional experience in key functional areas of the Libraries, including collection development, preservation, digitization, user services, and outreach. The one-year experience culminates with a capstone project, developed by the intern and the department head. This project requires significant effort in its planning and implementation and carefully matches the interests of the applicant and the needs of the Libraries.